Sana Saidykhan, doctoral student in the History Department, recently secured a research grant jointly administered by The Gambia’s National Centre for Arts and Culture and Germany’s The Gerda Henkel Foundation. Saidykhan plans to use the funds, totaling 2,500 euros, to support his preliminary dissertation research in The Gambia this summer. 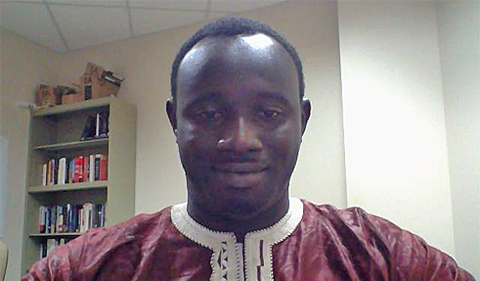 Provisionally titled “‘The Power of Karengak’: Ecology and Society among the Jolas of Foni, Gambia,” his dissertation project explores the intersections of colonialism, development, and environmentalism. Saidykhan’s research in The Gambia this summer will focus on the document collections of the Gambian National Archives in Banjul, the digital and oral collections of the National Council for Arts and Culture Research and Documentation Division, and oral history interviews in the Foni District. The National Centre for Arts and Culture is a semi-autonomous institution established by an Act of Parliament in December 1989 to preserve, promote and develop Gambian arts and culture. For more on the History Department’s graduate program, visit the department website.